Preheat oven to 375 degrees Fahrenheit and grease a cookie sheet. In a small bowl, combine cream cheese and jalapenos – mix well and set aside. Separate long ways on the perforation, so you have two long sheets of crescent rolls with 4 rolls each in them. Pinch the remaining perforations together on each of the two sheets (use a rolling pin if necessary) to make two continuous crescent roll sheets. Divide the cream cheese mixture and spread evenly over both crescent sheets. 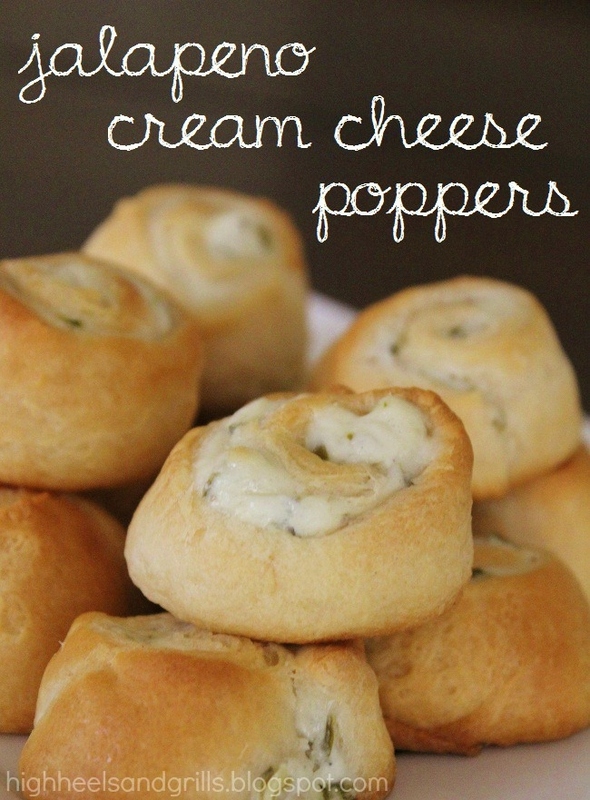 Cut each cream cheese/crescent roll into 12-16 pieces, depending on how big you want your resulting poppers to be. Place each one, standing up, on your cookie sheet and bake in the oven for 11-13 minutes. In my opinion, the jalapenos give it just the right amount of kick to make it interesting. You can add more or less jalapenos or cream cheese to better suit your heat tolerance. I hope you love them! That picture is making me hungry! And I’ve got tons of jalapenos in the garden. Just need some cream cheese and crescent rolls. I love three ingredient recipes! Nom. Nom. Get in my belly! Oh. My. These look delish! Will definitely be making these soon! My hubby was standing behind me while I was looking at this post and he said, mmmmm can you make me those? hahaha I guess I will have to be trying this recipe out! We love jalapenos and this recipe is right up our alley! Will definitely have to give these a try! These sound delicious! I will definitely be trying these! These poppers look sooooooooooooooo tempting! Y U M M Y ! Oh these look so good and my boys will go crazy during football games this coming weekend. Thanks…. Oooooh these look absolutely divine! I am sneaking over to the neighbor’s garden for some jalapeno. (Don’t worry I’ll share). So I saw these somewhere (probably pinterest) and made them a couple of weeks ago. And they were DELISH! and while I was at it, (not being healthy at all) I went ahead and added some real bacon bits to the mixture AND IT TOOK IT TO THE NEXT LEVEL! I highly suggest it. You can’t go wrong with bacon. Love these! Try drizzling a peach or mango chutney over them. SO GOOD! I hear jalapeno and think “yum!” This is right up my alley. These look great. I have a link party on Wednesdays, and I would love it if you would link this and any other posts. It is called Wednesdays Adorned From Above Link Party. It runs from Wednesday to Sundays. I hope to see you there. I would love for your to follow me. Have a great Day. Yum! I knew I shouldn’t have tried looking at links so close to lunchtime – I’m off to eat now – wish I had some of these though! Thanks for linking these up, I used to enjoy a bread from a Mexican bakery years ago that was stuffed with cream cheese and jalapenos and these would be much easier to make. Yum, these look perfect!! And so easy! Found you via the Summer Sharing Time 2012. Your recipes look super duper delicious! Following along now. You have got to stop sharing all of these amazing recipes! :) I will never lose the weight that I want to lose with these yummy recipes and beautiful pictures! Will have to make this one, too! Oh my goodness….. those look DELICIOUS!!!! YUM!!! These are awesome!! Would be perfect for game days! These are AWESOME!!! Would be perfect for game day. Go Texans!!! Going to try these but adding a little bacon to the mix. Hopefully they work out! Oh my goodness! This recipe looks delicious. I’m definitely added to our list of recipes to try. I love how quick and easy these are, and they make a great presentation at a party. Now it’s time to host a party so I can serve these! Have made these 3 times now in the past month! The hottest by far has been the canned jalapeños – the juice gets mixed throughout the cream cheese. Raw jalapeños are really subtle, and DO NOT USE canned mild chilis (I tried these only after my store didn’t have any canned jalapeños – it was such a disaster that I took them with me, but didn’t even take them out of the car for the party!!!). These are soon good. This last time, I put them on a plate with some bacon, and they ended up with a bacony taste. Maybe I’ll try to incorporate bacon next time. The possibilities are endless!!!!! !